Boy do I have a treat for you guys (lol)! 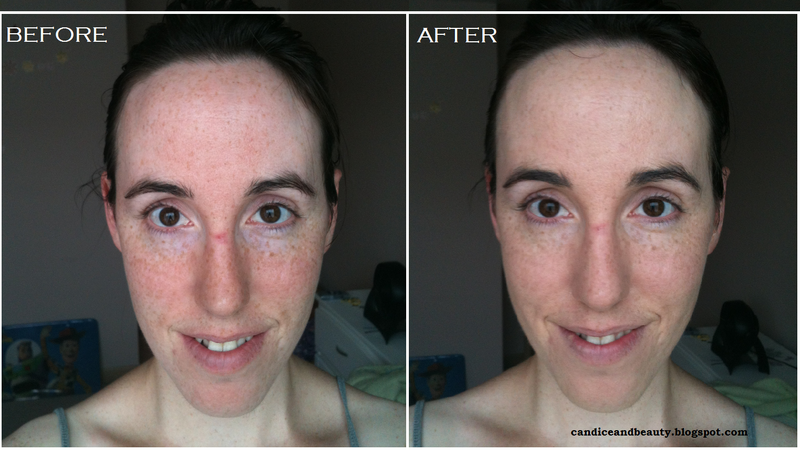 A before-and-after picture demonstrating the coverage of the Marcelle BB cream in light to medium! I've seen some before-and-after pictures on people who have gorgeous skin naturally but that doesn't say much, does it? So I'm giving you a before and after on skin that is prone to redness AND has a never-healing (under the glasses) pimple! Shall we start with that before the review itself? Feel free to click for larger size. ONTO THE REVIEW - What's a BB cream? Most of you know what a BB cream is, but for those who don't know about the new must-have beauty product, a BB cream stands for either beauty balm or blemish balm and it is an all-in-one product that can replace your morning moisturizer, primer and foundation, as well as often offering SPF protection and extra skin care properties like anti-aging, pore reduction, blemish control, etc. The first BB cream was formulated by a German dermatologist for post-op patients to cover scars and blemishes. They became all the rage in South Korea a couple years ago after celebrity endorsement and have now arrived to North America and more and more different ones can be found on the shelves. 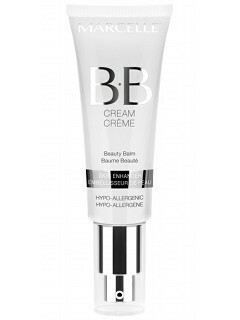 This particular BB cream is the first formulated by a Canadian company. It is a cream that they formulated to suit the biggest variety of skin types and colours. It does not treat any specific skin problems (like aging or blemishes) but promises to "perfect the skin to reveal a more even epidermis and well-hydrated, flawless complexion, all in one." A person with any skin type can use this cream, with its "self-adjusting pigments, powerful antioxidants, aloe and chamomile." It's worth noting that BB creams do not come in as many colours as foundation because it somehow adjusts to skin tone. This one comes in 3 shades. Light to Medium. Medium to Dark. Dark to Darker. Cost: 19.96$ regular price at Walmart but 22.95$ in pharmacies and other places for 45ml. This does not apply like moisturizer or foundation. It is significantly thicker but I still manage to apply to my entire extremely long face and large forehead in 1 pump, though I use 1 and a dot more just to be sure. I think 1 pump is about 0.5ml. So what I do now is that I still moisturize before because I have some patches of drier skin but I use a tiny bit of water on my finger after I've put on the BB cream to re-blend it. It's really not necessary but it makes me feel more confident. It absolutely does for me! You can judge for yourself, but it definitely evens out my skin tone and minimized the appearance of imperfections and pores. I would say it's a good makeup base. It definitely hydrates and soothes and I can't know for sure about the more long term effects like helping out premature aging, environmental stress and promoting skin regeneration but I believe it. It's also hypo-allergenic and fragrance-free. Here's the downer. This BB cream does not protect you from the sun. You will need to wear sunscreen or some sort apart from this cream which is a little bit disappointing. When I think about how sunscreen needs to be applied "liberally" though, I'm really not sure how much sun defense could really come out of the small amount of cream that I am using and I would prefer to use another product than spread my face thick with this cream or risk having less sun defense than I think I have, know what I mean? Marcelle recently came out with Anti-Aging SPF 20 BB Cream though which could be worth checking out. I've only tried this one BB cream but I don't feel the need to keep searching. I'm perfectly pleased with this product and would absolutely re-purchase. I will, of course, try any other BB cream that I have a sample of and am looking into trying an Asian BB cream to see the difference and I'd do some with an open mind but this is doing exactly what I want and need it to do. it would have been great if it had SPF, but i've heard nothing but great things about this BB cream - the saleslady at London Drugs was pitching it to me the other day, saying it is the best BB cream she's ever tried. i should use up my samples soon! woohoo I am glad you love it! ps. I HATE those annoying pimples you get from glasses/sun glasses! I always get some on the sides of my nose, especially in the summer! grrr. 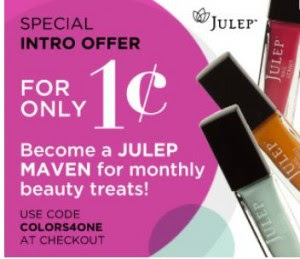 I definitely suggest trying your samples! Canadian Beauty: Yeah, it's so hard to heal when there's constantly something weighing on it! Thank you! I still need to get around to doing my post for that. Again, such a great and thorough review. I can see a lot of difference in the before and after. A lot of redness reduced and your skin looks really nice. I tried the Garnier BB cream but I wasn't impressed. I'm gonna give it another go though. I think they're quite different creams, but I haven't tried the Garnier..
Aw that's so sweet of you. I actually tried the Garnier BB Cream (Medium Light) and I've been quite happy with it :P I still use moisturizer though (but my skin is EXTREMELY dry, I always layer on moisturizer 2-3 times, so now I've reduced it to once + BB cream).